Some of the top names in fantasy and sci-fi art took visitors on a journey of the imagination at the recent Infra:Real exhibit. 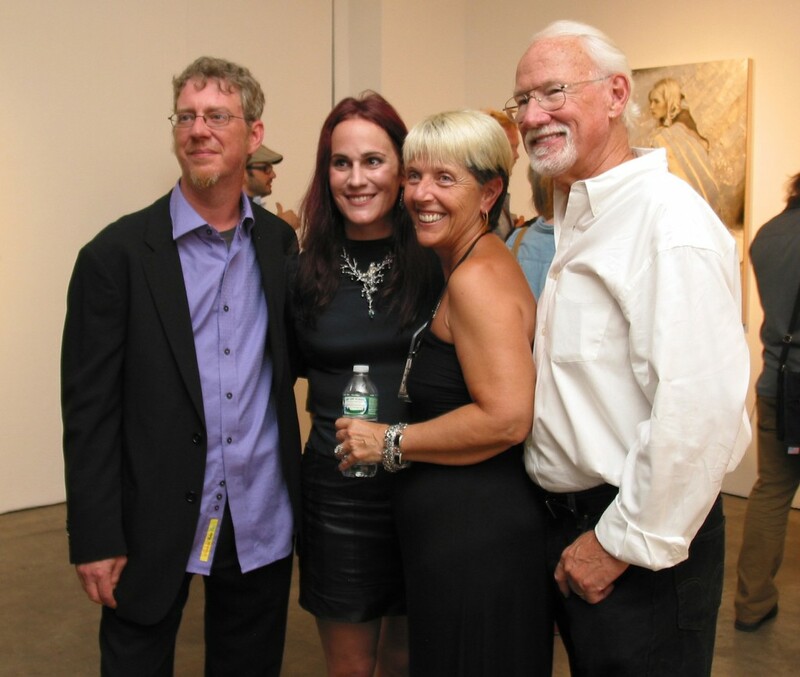 The Jonathan LeVine Gallery in Manhattan’s trendy Chelsea district was the site of a gathering of preeminent fantasy and science-fiction artists Aug. 5 for the opening of the gallery’s new Infra:Real exhibit. Curated by Patrick Wilshire, the show brought together some of the biggest names in speculative art, including a who’s who of Magic: The Gathering artists. Wilshire described the exhibit as an opportunity to “present the broad spectrum of imaginative realism,” and indeed the art on display included everything from traditional illustrations of dragons to cyberpunk street scenes to the “taxidermied” head of a creature taken from the Island of Dr. Moreau. “I wanted to be able to show how far the field extends from one side to the other and give people a chance to see how many different things there actually are by artists who are working under this banner,” Wiltshire added. Spread across two gallery spaces on West 20th and West 23rd streets, the minimalist white walls of the exhibit areas allowed sorcerers, apparitions, and creatures out of both space and dreams to nearly leap forth from their canvases. As visitors mingled and met with artists, a menagerie of merfolk, robots and more watched over the gathering with equal parts menace and whimsy. For Magic fans, the exhibit was an opportunity to see imaginative works by some of the game’s most iconic contributors, including Rebecca Guay, Greg Hildebrandt, Donato Giancola and Anthony Palumbo, many of whom were on hand for the opening reception. 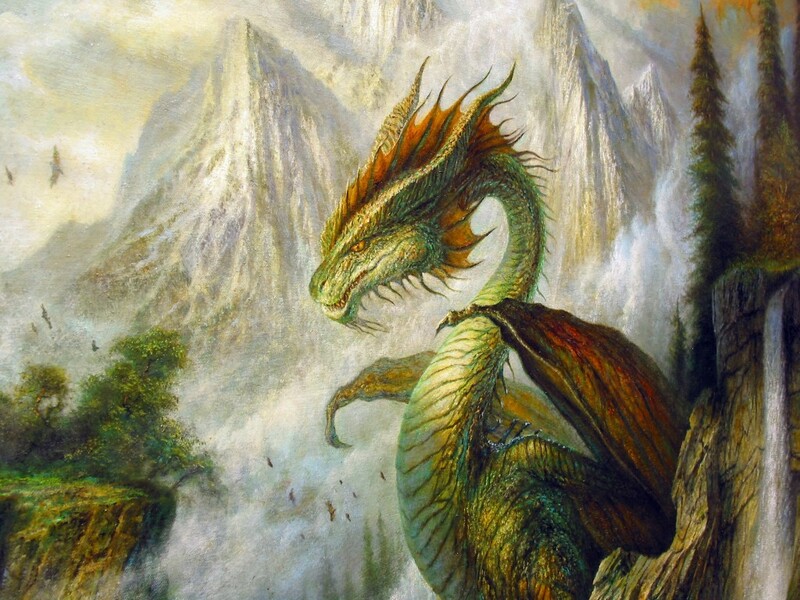 Bob Eggleton, who is known for illustrating dragons and who provided several for the game — including Alabaster Dragon and Gilded Drake — believes there’s a reason why fantastical creatures, especially dragons, continue to capture the imagination. “They’re mythical, great animals, and we don’t know if they’re related to dinosaurs or some other kind of other animal. We just really don’t know where they came from. They appeal to our psyche and to our love of mythology. And I think it’s great when you don’t explain where these things come from,” he said. Eggleton’s piece in the exhibit was titled “Dragon Spring,” and it depicted a green dragon in a wooded landscape surrounded by mountain waterfalls and a small pond. As for his own draconic influences, Eggleton counts the creatures from the 2002 film Reign of Fire among his favorite dragons. 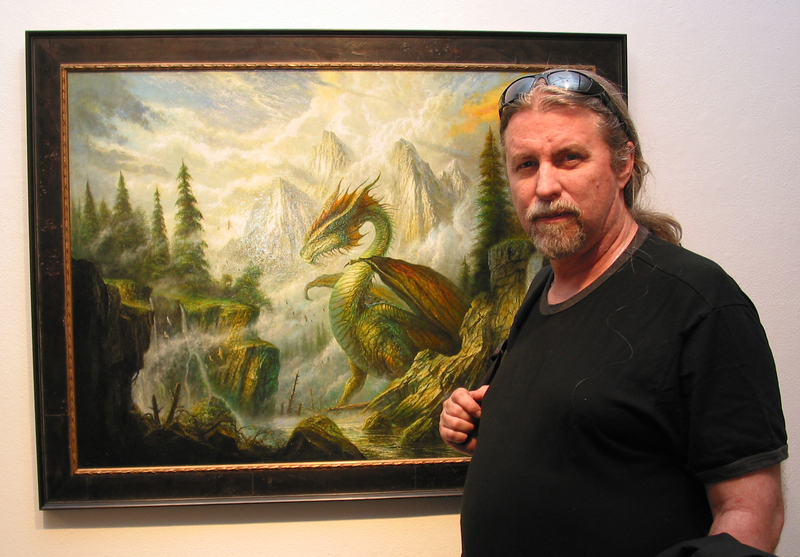 Artist Bob Eggleton stands with his painting “Dragon Spring” during the opening reception of the the Infra:Real exhibit. Also in attendance was Greg Hildebrandt, one half of the legendary illustration duo The Brothers Hildebrandt. Greg illustrated nearly 70 Magic cards in his time working for Wizards of the Coast and designed, along with his late brother Tim, the original poster for Star Wars, among many other iconic fantasy and sci-fi works. Infra:Real curator Patrick Wiltshire (far left) poses for a photo with artist Greg Hildrebrandt (far right). Greg explained that it was always important for him to tell a story when approaching an assignment for Wizards of the Coast, whether he was illustrating some of the fantastic creatures of the Multiverse or powerful artifacts like the Darksteel version of Aether Vial. Greg also got a chance to poke fun at certain fantasy tropes with his artwork for the Unhinged card Avatar of Me. In it, a man watches as an idealized fantasy version of himself — muscle-bound and tattooed, with spiked gauntlets and leather pants — strides out of a mirror. As evening progressed, the urban canyons of New York ensured that the heat continued long after sunset. The temperature, though, didn’t stop visitors from moving between LeVine’s two exhibit spaces while trying to keep cool with sweating bottles of water. 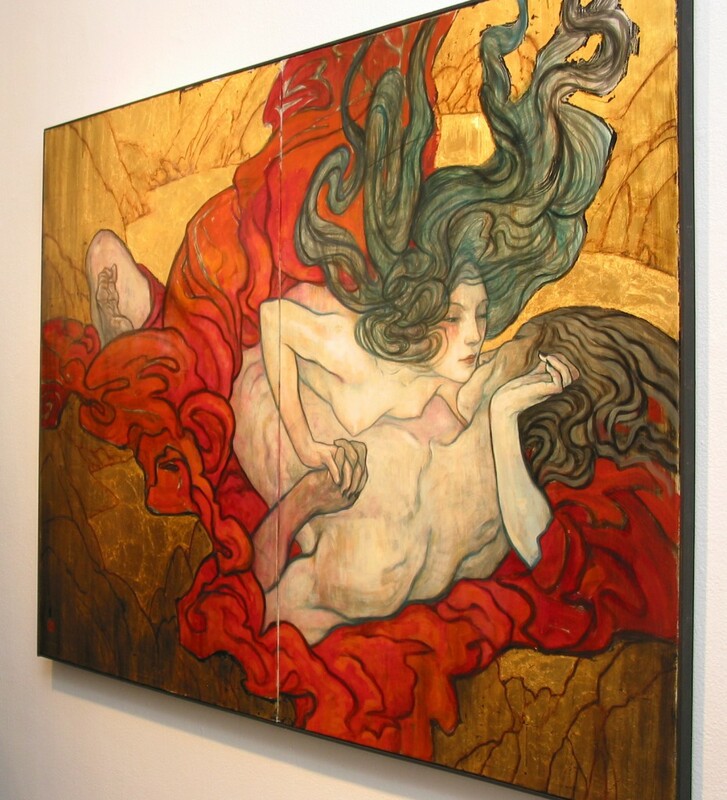 Adding to the charged atmosphere were two large-scale pieces by Rebecca Guay: “The Moth” and “Red Sugar.” With the flowing, almost liquid lines for which she is known, Guay used these two pieces to explore aspects of human relationships. 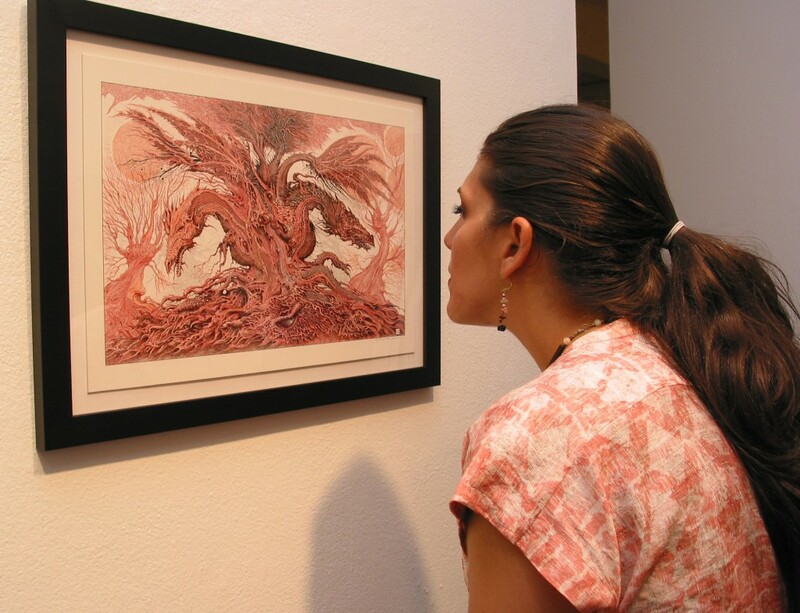 Rebecca Guay’s painting “Red Sugar” on display at The Jonathan LeVine Gallery for the Infra:Real exhibit. Guay went on to explain that most of her gallery work of late has dealt with these topics as she tries to get down to the elemental foundation of human relationships, especially the duality that can exist between couples. Turning to her work for Wizards of the Coast, Guay has a new-ish piece in the recently released From the Vault: Angels set — new-ish in that most Magic players have likely never seen her take on Serra Angel even though she did the painting in 1996 for Armada’s Serra Angel comic book. Though Guay doesn’t have any active assignments with Wizards, she would welcome more card work in the future if she felt she could do justice to the art requirements. One artist whose work was on display and whose paintings will appear in the upcoming Battle for Zendikar block is Anthony Palumbo. 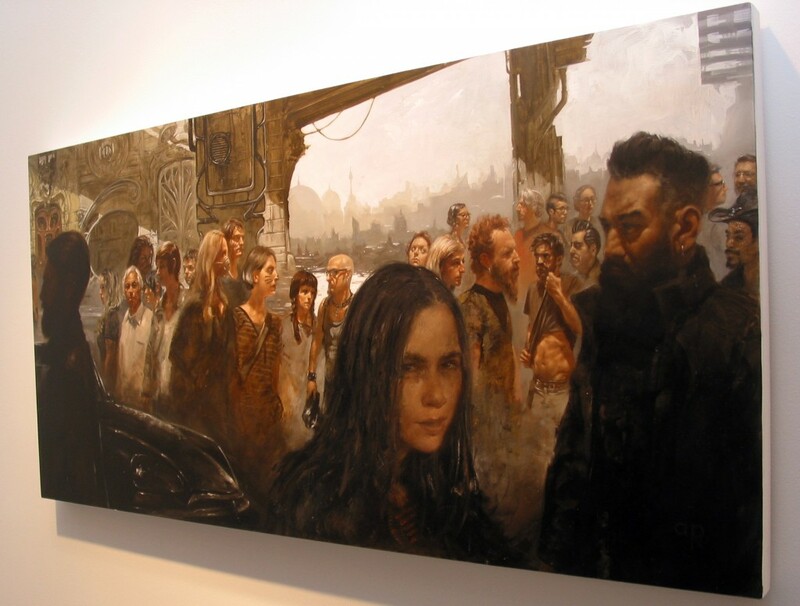 Palumbo’s Infra:Real piece was titled “The Children” and can best be described as a kind of cyberpunk-style street scene that melds old elements and new. There’s so much going on that one can’t help but wonder about whether the painting is set in the past or future, and where each person on the street is going. Anthony Palumbo’s painting “The Children” on display at The Jonathan LeVine Gallery for the Infra:Real exhibit. That personal passion has made its way into his Magic artwork as well, especially assignments where Palumbo gets to illustrate people. With speculative art in general, Palumbo is a big fan of science-fiction work from the 1970s, especially things like Heavy Metal magazine. “The whole reason for the magazine to exist was to push boundaries,” he said. This is a goal that Palumbo aims for in his own work, though it’s often hard to identify if one is breaking new ground while in the moment. Anything unsafe, he explained, is probably a good thing. And yet that sense of danger was lurking in the framed images just a few feet away. What is the shaman holding in her urn, ready to unleash upon the world? What do the rampaging dream zebras portend? What’s in the green beverage being poured by the hostess with the peacock feathers? The inability to answer these questions, to discern whether they take place in our world or in a world like ours gets to the very heart of the exhibit’s title — Infra:Real.